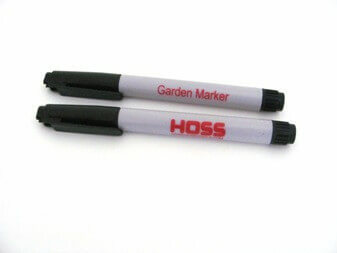 Our Garden Marker is a permanent ink marker with a medium point. Use it in the garden and greenhouse for labeling your plant trays and garden rows. Keep track of all your plantings with our Hoss Garden Marker. This permanent ink marker has a medium point and is non-toxic with odor free black ink. Use it to labels bags of seed to keep track of germination rates and the age of the seed. It easily writes on all types of surfaces including wood. Use on our Wood Garden Labels to label seed trays in your greenhouse or indoor growing room. Also use out in your raised beds or vegetable garden to mark your different varieties of vegetables planted. Our Garden Marker is sold in packs of two and is MADE IN THE USA.